This rendering designed by Earl Swensson Associates shows the future Fall Creek Falls State Park Inn. 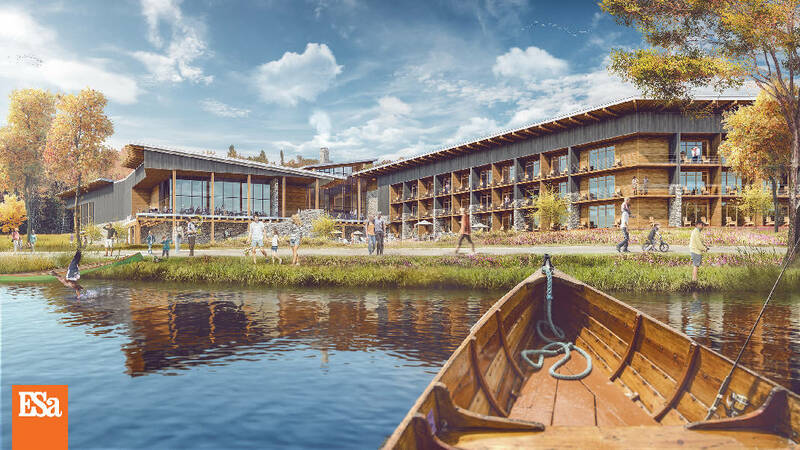 The facility will feature lodging, a restaurant and conference center in Tennessee's largest and most visited state park (Contributed rendering/TDEC). Officials on Tuesday officially broke ground on the new inn at Fall Creek Falls State Park on the Cumberland Plateau. "This reinvestment in Tennessee's most famous state park is indicative of similar reinvestments made from Memphis to Kingsport," Deputy Commissioner of the Tennessee Department of Environment and Conservation Brock Hill said in a news release. "Over $175 million in capital reinvestment is already paying back dividends through increased visitation, customer satisfaction, and revenue growth." Demolition of the old inn was completed in the fall to ready the site for the $29.4 million, 95,000-square foot replacement inn at Tennessee's second-largest state park. According to the news release, the new inn and restaurant are forecast to generate $278,000 per year in sales and occupancy taxes, a growth of $90,000 per year compared to revenue from the previous facility. Short-term, construction is expected to bring in an estimated $14.7 million in taxable spending to the area, along with more than 100 construction jobs, state officials said. The new inn is "designed to reflect the natural setting of the park and will include three floors of visitor space with double rooms, king rooms and suites at the inn; indoor and outdoor gathering areas with larger meeting rooms for conferences; and paths connecting the facility to recreational trails at the park," the release states. The restaurant faces Fall Creek Lake, providing scenic views for diners. Fall Creek Falls State Park has seen the renovation of 20 cabins and the refurbishment of an additional 10; renovation of Village Green buildings; installation of a new irrigation system at the golf course; renovation of the swimming pool and snack bar area; new playground area; roof replacements; restroom upgrades; and fresh paint, officials said in the release. The state now manages or oversees more than 225,000 acres in Tennessee, one of the largest state park public land portfolios in the eastern United States, officials said.